Here at Narromine Pharmacy we are operating the very latest in dispensing technology. 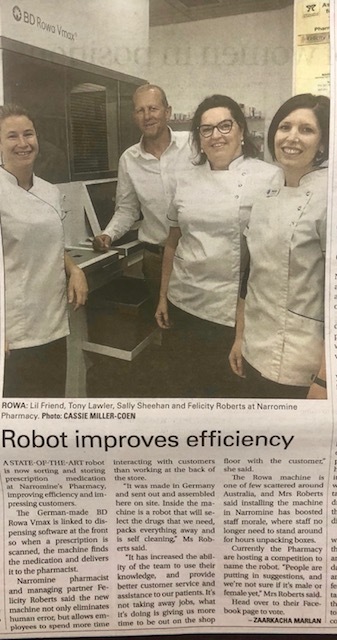 SPENCER (as the robot has been name), provides the maximum level of efficiency in checking medication, provides faster dispensing (meaning more time with our customers), has a highly advanced storage system and even self cleans! We are excited to be sponsoring women's local rugby this year. We wish you the best of luck for the season ahead team.......GO Gorillas ! Check out our February catalogue. Lots of back to school updates, health advice & savings galore! Sale items are available until March 3rd 2019.